IDE (Integrated Drive Electronics) was an interface developed by Western Digital after the IBM AT computer for disk drives. The IBM AT computer had a disk controller designed by Western Digital that connected to the hard disk drive. To reduce costs for future computers, WD integrated the controller into the disk drive. As a result, the disk could be connected directly to the AT bus without a controller card. To save having a plug in card, a 40 pin connector was specified that could be designed directly into the computer motherboard. So now the disk could be connected directly to the motherboard without the need for an AT bus card or slot. The first drives and computers with this interface appeared in 1986. This interface was very limited, as it was only designed for hard disk drives. However by the late 80’s users wanted more storage devices, especially CD-ROM drives. The original IDE interface only supported disk drives and only two of them at most. Western Digital and others wanted to generalize that interface so that it could support more disk drives, and more importantly CD-ROM drives, Optical disk drives, and IOMEGA zip drives. In 1994 after two years of standards work the ATA (AT Attachment) standard was developed, an extension of IDE. Since we were very involved with CD-ROM manufacturers we were well aware of this development, and participated in the standards discussions. Future Domain even hosted the development of the CD-ROM bootability standard, which became known as the “El Torito” standard because we held the meetings at a restaurant nearby with that name. We also helped develop a software interface standard for ATA called ATASPI. Once again software would make the difference. During this time we held internal discussions on what the adoption of ATA would mean to our business. Our OEM disk drive customers told us they would introduce ATA CD-ROM drives in 1993, with volume production in 1994. Several of them asked for help with an IDE adapter. 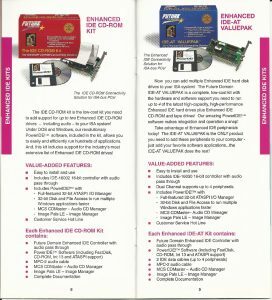 PC’s in production in 1994 would not have the new ATA connectors or BIOS, only IDE. Since we were intimately familiar with the new standard, we could deliver both hardware and software to make it work. That is what we did. Erv Hauck, my VP of Engineering pointed out that these would be interim products, within two or three years the ATA interfaces would become standard in all PC’s. 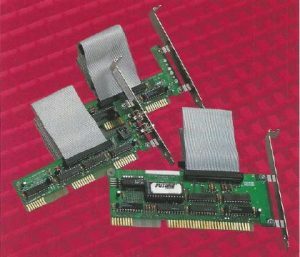 In addition, an ATA adapter would have to be much lower cost than a SCSI adapter because of the reduced functionality. We agreed not to spend a lot of money on LSI integration. The adapters would be simple to manufacture and for the first time manufactured in China. NEC was the first company to give us a purchase order for ATA adapters, followed by Panasonic and then others.